S3F has a heavy focus on accuracy. Their mission is to bring high-quality, match-grade barrels to customers at a fraction of the price. Each barrel goes through rigorous quality control, ensuring each product is mathematically symmetrical and meets all SAMMI specifications. 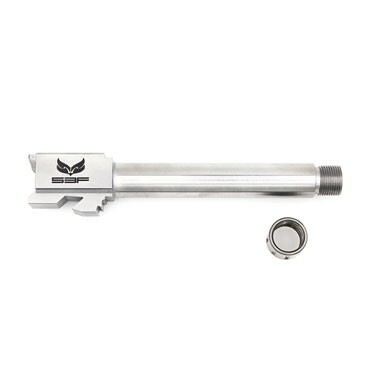 The S3F Threaded Glock barrels are drop-in ready. We accomplish this by putting every barrel through a rigorous quality control process; to ensure each barrel is as close to mathematically symmetrical as possible, and meets SAAMI (Sporting Arms and Ammunition Manufacturers’ Institute) specifications. These proprietary chambers are spec’d for shooting either factory or reloaded ammunition, and are ready to be dropped into your gun and run! We are confident you will be satisfied with your new S3F barrel, because thousands of shooters, from Pro to recreational already are! Thread protector (Price included with threading): Yes, In matching finish!